Look what we picked at Trehane nursery near Wimborne, today. I am sitting munching on blueberry’s as I type. They’re the healthy alternative to sweets and and cost £7 a kilo. Online I can see that one supermarket can match this price – I don’t think they are from the UK, let alone local or consumed the same day that they are picked! 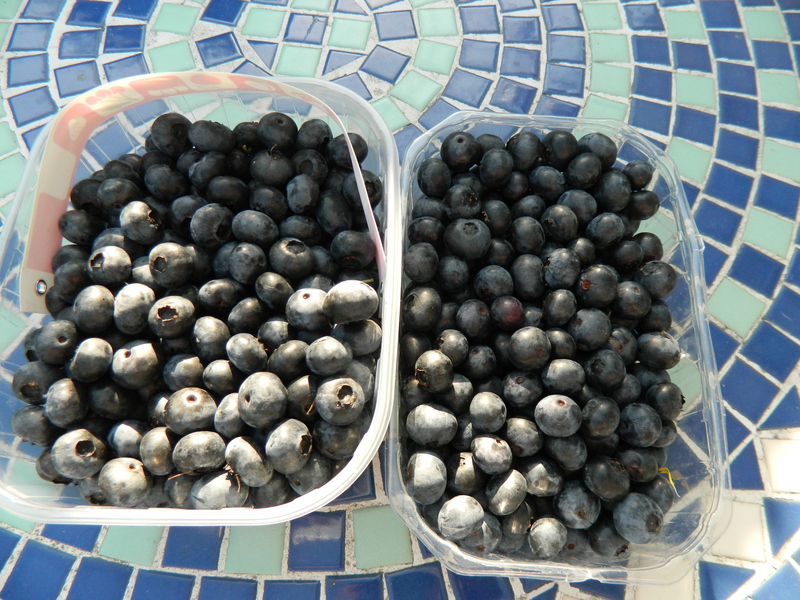 I am trying to come up with blueberry recipes as feel sure that there are only so many we can eat au naturel, and while I am going to freeze some, I want to think of some creative ways to use them in recipes. Which published a report on Monday rating supermarket bought cereal bars. They found that most were high in sugar, fat and/or salt. Nothing has really changed over the years with cereal bars – they are high in sugar usually – as the focus of many company’s health claims is that a product is low in fat then it’s healthy – so instead they will tend to add extra sugar (more than is needed) and sometimes will include additives. Avoid bars with unrecognisable ingredients that you wouldn’t find in your kitchen cupboards. Look for bars with at least some fibre – this will slow down their release of energy (bars high in fibre contain 6g or more per 100g). Organic does not automatically mean it’s healthy in terms of nutrient profile – it can still be high in sugar, fat and salt. Organic products however will not contain artificial additives or hydrogenated fats. Even better, make your own, it doesn’t take long, it’s cheaper, you know what’s in it. Just have them for pudding or a sweet – they’re great for picnics. Don’t ever have them for breakfast – you wouldn’t have a biscuit for breakfast now would you? Will keep for 4 days in an air tight container – though they probably won’t last that long. Grease a 7 inch square shallow tin and pre-heat the oven to 180°C/gass mark 5. Melt the butter in a saucepan and put in a bowl. 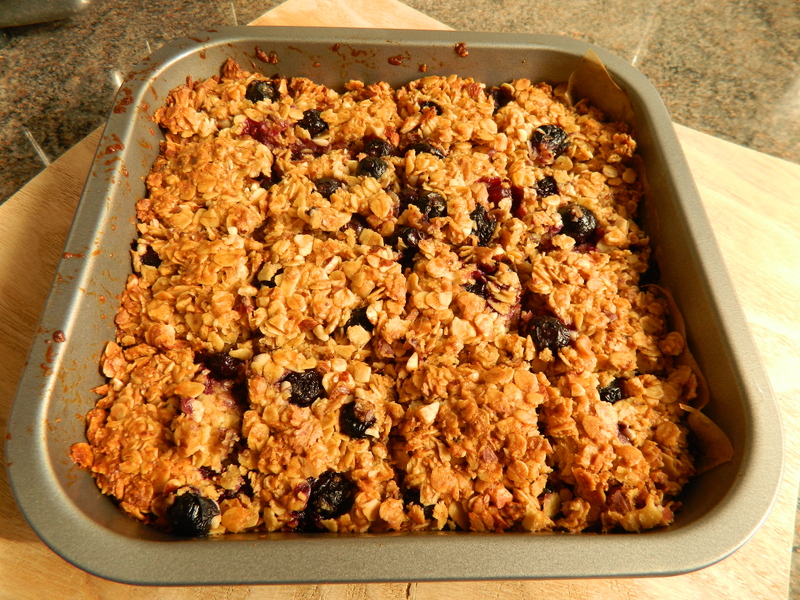 Add the honey or golden syrup and stir until it has dissolved and then mix in the oats, flour, blueberries and almonds. Press into the baking tray evenly. Bake for between 22-25 minutes until golden brown and firm. Cut into squares while still warm but leave until cool. Put a big plate over the tray and flip the flapjack onto it and peel off the paper. Then flip again onto another plate so its the right side up. *This is the lowest amount of butter that would work for this recipe. **Try other nuts and/or seeds. can’t wait to make these tonight, they look great! I hope to take them on my camping/climbing trip this weekend. should be good quick energy snacks. yummy these are delicious, thanks for sharing this recipe.